Sheaffer Ferrari 100 Rollerball Pen SHF95011 $25.99 Make that special occasion even more memorable with this rollerball pen. Specially formulated ink flows flawlessly for a smooth, enjoyable writing experience. 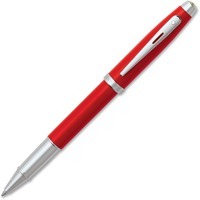 The glossy finish adds a perfect touch to any writing task for use in any professional setting. Handy pocket clip secures tightly to various locations to ensure you always have a writing utensil within easy reach.